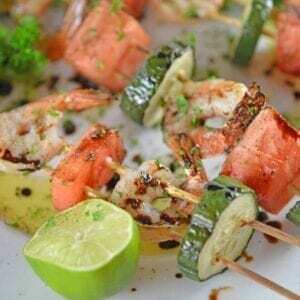 Watermelon Shrimp Kabobs combine grilled shrimp with grilled watermelon with a sweet balsamic reduction and zesty lime. A healthy kabob recipe on the grill. In a large airtight plastic bag, combine peeled shrimp and Italian dressing. Massage well, set aside. Meanwhile, soak wooden skewers, if using them. After 30 minutes thread marinated shrimp, cubed watermelon and zucchini onto skewers. Heat grill to medium-high heat. Prep with cooking spray or rub grates with vegetable oil. Grill on indirect heat for 10-15 minutes. This will depend on the size of shrimp you are using. Wait for them to be pink and start to curl. Remove and drizzle with balsamic reduction, extra virgin olive oil and spritz with fresh lime juice.